Every now and then the folks back at HQ see fit to send us some shiny new gear! This holiday season, we've unwrapped a shiny new website. You may have noticed a few changes. First and foremost, welcome to the modern web! We’ve overhauled just about everything to modern standards. Heck, we’ve even got a WYSIWYG editor in the backend now! Even better, we can feature more content without knocking the latest patch notes off the page. Secondly, check out that calendar: it’s got a bunch of community and official events. Whether you’re looking for a SquadChat or the next round of organized play, there should be something going on in the Squad world for you. Want your event there? Let us know! Third, we’ve got some more helpful links spread throughout the site, especially just below the fold. We know the battlefield is a rough place and we’re doing our part to help make it a little more friendly. 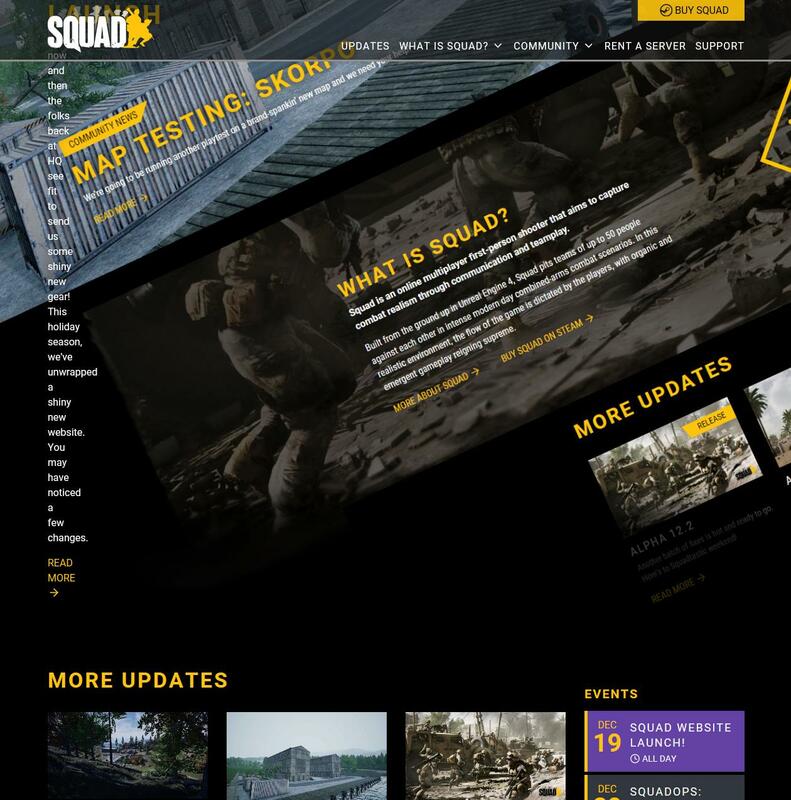 Keep a lookout for more helpful and informative updates as we put the finishing touches on Squad and more. So, there you have it: brand new look, same ol’ Squad. We’re putting our dress formals on; it’s gonna be a big year! While most of the content may not strike you as new just yet, we now have a web platform which is built for expansion and easier changes, so look out for some more changes coming up in the future! Liking the new duds? Something broken? Be sure to let us know in the forums! Sweet! Looks ace! No ping on Discord on this? Seems news-worthy = ping-worthy. By the way, the links posted on the Official and Modding Discords to the current Wrench are broken. 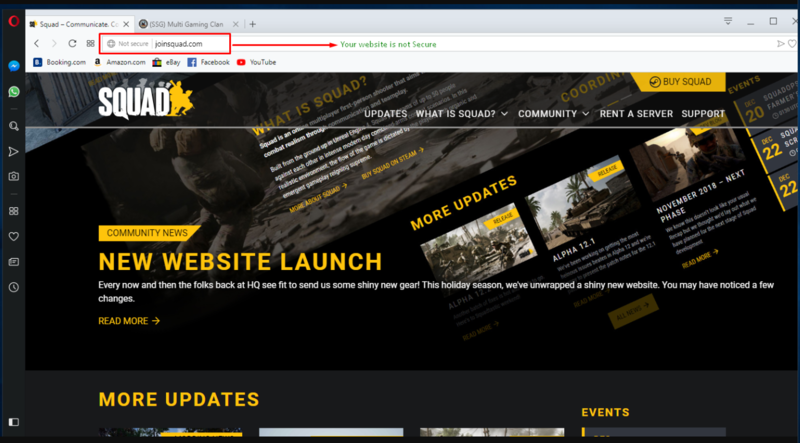 I love the integration with the Squad Wiki! Makes me super happy. Ha, thanks for that, wrote redirects for literally every single newspost in existence, but of course forgot the one which was published after I wrote this. This is fixed now, thanks again! Nice to see the site getting a facelift! The pure white on black contrast is a bit hard on the eyes tho. I feel like the dark theme could use a bit of extra negative space, and values to make it friendlier to look at. Love the new site, looks great!! Looks like this in Edge. Good news: The fix is easy. 95% (if not more) of the traffic on the web is using a browser that's more compatible with web standards -- we'd recommend updating with them. We A) don't use cPanel, B) are migrating the SSL certificate over to the new server right now and C) are working on the configuration for it. It's more than just doing an automatic redirect to HTTPS with making a website use SSL. I like the integration of some of the social media feeds to it. As an old fart I like to stick just at Forums, but on the other hand it is nice to see the latest small perks from more fast phased media platforms. Mediawikis pop-up adds are a bit intrusive as experience. The old website looked better imo. I'm with you on this point. What doncha like? We're still improving and growing. =) There are some changes we'd like to make too, now that we've settled into using it for a little bit. A lot of the improvements are in the background, like adding an actual WYSIWYG editor, better media management, the ability to showcase more news and content, etc. Lots of cool stuff coming up!! The website for me is broken under https, when i swith to http it works. Nice job on the website all. Nicely done. What about the RECAP? It's taking too long. Not cool. Recaps are usually released between the 2nd and 4th of the month(mainly the 3rd), so it's not too long, pretty much on time - This months one is aiming for a Monday, since things are being added last minute, as per our recap lord @Gatzby has said.